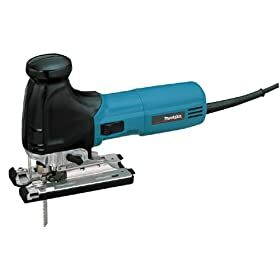 This orbital jig saw features a built-in, shock proof, high output white LED light that illuminates your cutting edge for more accuracy and faster cutting. 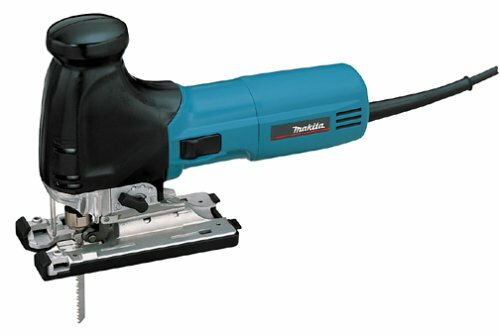 Makita’s "tool-less" blade feature means no more burning your fingers on hot blades. An electronic speed control system maintains constant speed under load for smooth cutting. A powerful 6.3 amp motor delivers 8 -2,800 SPM for 48-percent faster cutting with 40-percent less vibration. Makita hushed this tool down to make it the quietest tool in its class. It’s lightweight, too, weighing just 5.3 lbs. for easier handling. Never seen a smoother jigsaw. Cuts 45 degree angles in 2X treated lumber and leaves a smooth sanded edge. Never bogged it down. It sings and cuts like a dream every time. This is the fourth jig saw I have owned, and I never knew they could possibly be this good. The other three were usually more trouble than they were worth. I am an avid do-it-yourselfer and have completed home projects from building a room addition to laying hardwood floors, building built-in bookcases to building rabbit cages, and just about everything in between. This saw is amazing. Its handling is unsurpassed. It cuts smoothly and is incredibly easy to manuever, making difficult angle cuts a breeze. As far as I am concerned, this saw is in a class all by itself. Owned 3 months with no regrets. Upgraded to this Makita barral type saw, by necessity, after a cheaper version made by Skil began to excessively throw blades after a year of use. My cheaper version saw, and most other cheaper versions, use a different blade holding mechanism (and different blade shanks) that can be prone to letting go of the blade when hitting a knot, or binding in a curve. I haven't experienced this with the Makita. The quality of cut is very good when using one of the 9 blades that they supply in the package. The fit and finish of the tool is mostly good, the only complaint is the seams between the black and teal plastics don't meet as well as I'd like, but the castings are well done and the saw feels substantial when I hold it. The saw has an anti-splintering device, like a zero clearence throat plate in a table saw, that surrounds the blade and while marginally effective it is quite fragile and probably better to leave in the box. The tool also comes with a plastic base cover that conceals the units metal base plate when working on items you wish to avoid scratching. This I've found to work quite well (Though I'm not certain that the metal base would scratch anything when new). The angle change adjustment is a solid design and requires an alan wrench that rides in a tool holder in the base. My base plate was normal to the blade out of the box. The saw also has a soft start which is nice, since this saw doesn't have a trigger type speed control, (it only has a power switch coupled with a variable speed dial) it helps keep the blade in the kerf when finishing a previously started cut. I can't say much about the orbital cutting action except that the switch to change the cutting action feels strong and well built. I don't use the orbital settings because I'd always rather have smooth cuts than rough and quick. I recommend this saw to anyone contemplating the purchase of a jig saw and wholely discourage the notion of buying a cheaper one, unless you enjoy unimpressive results and intend to replace it in the near future. This the second one that I have bought for the company and it is a very nice saw to work with. The LED light is very useful when getting in to dark cabinets or dim lighted areas. Blade changing is a breeze.I am going to buy another one for myself. I wasn't looking for a "soft start" device but it is extremely useful when resuming a cut with the blade already in the workpiece. I've had a dozen jig saws in my life and this is the best (and most expensive). The barrel grip gives very good control and reduces the size of the tool so I'll not go back to the other type again. Blade changing is a snap. Standard blades. The light is nice, and the fan really does blow the chips out of the way.